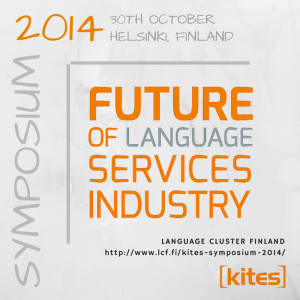 Last week we participated in KITES Symposium 2014, the top language industry event in Finland, to hear and discuss about the future of language services industry. There were many interesting presentations from different points of view. We want to share some of the thoughtful ideas and opinions here with you. Tarja Salonen, the Chairman of the Board of KITES (Language Cluster Finland), opened the event by stating that international business always requires language management. Nowadays the many economic and finance seminars are searching for solutions to create new economical growth, but often they tend to ignore the power of languages in the global success. Languages and language strategy are an essential part of business development and a matter of top management. Mika Pehkonen, the head of the localization team at F-Secure, gave a real life example of how to manage translation and localization needs of more than 25 million words and 16 000 translation packages in a year ─ and with a team of only 3 people. The solution is automation and technology. New texts with priority labels are automatically collected from the system and sent to the outsourced translators every week. With such a huge translation volume there’s no point of asking if the development team needs translations (every new word is translated) or if the translator could fix a mistake (he can do it next week or an automatic fix can be created if the error occurs frequently). An ongoing process like this makes it possible to both keep the process efficient and pay the translators by hours. The results are impressive: 20% more words are translated and the quality has improved even more than that since the automatic process has been introduced. David Marshall, Sales Director at SDL Language Technology, talked about digital content and its importance in purchasing decisions. Global digital content is the main source of information for customers. In 2014 people look for information using 10,4 sources before making a single decision to buy (5,3 sources in 2010). 27% of Internet users speak English, and even if the person can read text in another language he probably isn’t ready to buy using that language. Still only 0,00000067% of the digitized information created every day is translated. Localization is the only way to speak to people on emotional level. Susanne Ranta-Kiiski, Marketing & Communications Director at Novita, told how their company has taken the first steps in becoming an international brand. Novita is a lifestyle brand specialized in yarns, knitting equipments and ideas. Currently they are extremely powerful in the Finnish markets but completely unknown elsewhere. Pure translation won’t work when the goal is to conquer hearts of the consumers. This requires real localization. The challenge is that the company values have to be coherent everywhere even if the communication is unique in every market. Novita’s example also shows the opportunities that Internet has to offer. After launching their English site with right keywords visitors started to come to their pages from all over the world. Seija Suonuuti, a real expert of terminology work, showed the importance of termonology management because all companies have to deal with terminology. The key is to pay close attention to the word usage. In worst cases, the many synonyms and close variants in the communication make it difficult to understand the message. Unfortunately, issues in terminology are often left acknowledged or other factors are blamed for the problems. For example, software user interfaces may feel difficult to use when the terminology and vocabulary are incorrect. Terminology work is especially important for international companies because localization multiplies the term base anyway. Well-planned and organized terminology work improves quality and saves on average 20% in time and money. As a conclusion, the value of language strategies is remarkable to all international businesses. Consumer behavior has changed in the online world. Often the purchase is made already before the consumer has any contact to the company. The role of global digital content is unquestionable. In the localization process, automation of routines and boring work saves time and allows people to concentrate on the valuable translation work. Achieve best software localization quality with Multilizer. Let the technology do the routine work and quality validation. You’ll get better results faster. Learn more.